Have you ever tried to communicate with someone who didn’t understand you? Do you remember the frustration you felt when you were not sure if your message was heard? While you may have only experienced this a couple of times, people with a communication difficulty can experience this every day. 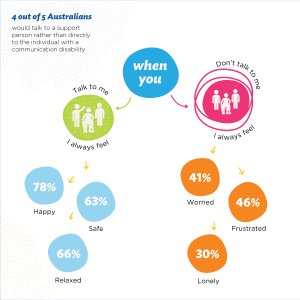 Many Australians do not feel confident talking to people who have communication difficulties because they are worried about the awkwardness or misunderstanding the other person. Organise a silent morning tea for work colleagues or friends. Register with us, and download your free resources and games to play on the day. Print out the resources, game cards and instructions. Show the video on a projector or TV. Remember, NO TALKING! Use pen and paper, key word sign, apps, communication boards, etc. Be creative with your communication methods! Take some pics and share them with us! It doesn’t have to be a fancy location; anywhere is fine, just as long as there is tea (or coffee!) and games. The official month for Silent Morning Tea is October; pick any date that works for you. 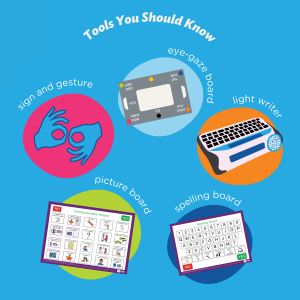 Having some simple alternative communication strategies for people to use can be a great way to spread awareness about AAC (Augmentative and Alternative Communication). Try having a few communication boards, community request cards or even a voice output device that can speak recorded messages. Key Word Sign is used to encourage and support language development in children and adults with communication difficulties. Key signs (borrowed from Auslan – the language of the Deaf community) are used in conjunction with speech to give visual support to language and communication. Take time to reflect on what it is like to have a communication difficulty. However, whatever you do, don’t forget to have fun, enjoy yourselves, and involve other people in celebrations – the more the merrier! Tag Scope and use #SMT18 or #SilentMorningTea18 to spread the message.